Your first experience being arrested can be confusing and even scary, especially if you don’t know what to expect. Here are a few things to keep in mind that can make your time in jail easier. The terms “jail” and “prison” are often used interchangeably, but in fact, they are two very different environments. Jails are designed to hold suspects from the time of arrest until trial (or until bail is set and paid). For this reason, jails tend to hold detainees for shorter periods, usually less than a year. Another important difference is staffing. While prisons are run by the state or federal government and are staffed by corrections officers, jails are typically staffed by sheriff’s deputies. Remember also that although you are in jail, you are still presumed innocent in the eyes of the law. Arrest itself can be an unsettling experience for anyone, and a first-time arrest can be especially jarring. You are losing some very basic freedoms that most of us take for granted. First, the arresting officer will cuff you and read you your Miranda rights. Next, you’ll be brought in for booking. At this time, you will be forced to surrender all personal items you may have on you—including your cell phone. If you don’t have the cell numbers of friends or family memorized, you won’t be allowed to look them up. During the booking process, you’ll be strip-searched, fingerprinted, photographed. Try to stay calm and be respectful to the officers, deputies, and any jail staff you encounter. Most jail staff are good at “reading” people, and they’ll be looking to see if you’re going to give them problems. Stay calm, answer all questions honestly, and keep your answers brief. Follow all staff commands without complaint, but don’t offer up any unnecessary information. Avoid any behaviors that could be interpreted as challenging to either officers or staff (such as cursing, shouting, or spitting). Remember, staff can make your time in jail easier or harder for you. Unless you have a true medical emergency, don’t request medical care. This can mean a trip to the hospital that will ultimately prolong your jail time. If there are meds that you absolutely must have, try to arrange for a family member to bring them to the jail. You are allowed to use the jail phone, but this can be trickier than it sounds. Cell phones don’t accept collect calls so you’ll have to try to reach someone on a landline, and that person will have to agree to accept the charges on the call. An old trick is to wait for the operator to place the call request, and when you hear your party pick up, quickly state the reason for your call before they have a chance to accept or decline the charges. For example, “I’m in Polk County Jail—come get me out.” This can give a friend or family member enough info without incurring the charge for the call. 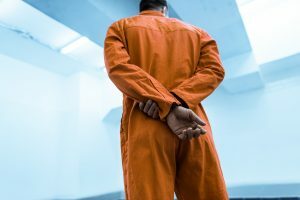 When you’ve been processed you’ll likely be placed in a holding cell, and you probably won’t be alone. Try and stay calm and don’t volunteer unsolicited information about yourself or your case. The best strategy is to be polite but quiet. Avoid any obvious signs of fear or aggression. Even if you think you’re tough on the street, remember that in jail any challenges will be answered, either by another detainee or by staff, so keep the bravado to a minimum. If you are unable to make bail quickly or are arrested on a Friday night and must await a Monday appearance before a judge or magistrate, you’ll likely be placed in general population with many other detainees. You’ll be assigned a bunk and will have little or no privacy. Try to get along with those in your area and avoid any conflicts, as fighting can do more than get you injured, it can also extend your stay in jail. Another thing to avoid is being indebted to another detainee. For example, if someone offers to share their commissary with you, they might expect something in return. Your best bet: don’t accept favors. Finally, don’t show weakness. During your first night in the general population, other detainees might try to rattle or scare you. Don’t let their taunting get to you. They’re just probing for signs of weakness. You probably won’t get much sleep, but If you get through the first night without demonstrating anxiety or fear, you can avoid being marked as an easy victim. Not all stays in general population of filled with the stress described above; some stays can be benign and calm. But it is important to prepare for all situations. We hope these tips help ease the pain and confusion of your jail experience. Remember that a certified and established bail bond agent can be your best ally if you’ve been arrested. A qualified bondsman can help secure your release until trial with only a minimal financial burden to you, your friends, and family. If you’ve been arrested, you don’t have to go it alone, contact us to learn more about what Bond James Bond can do for you.